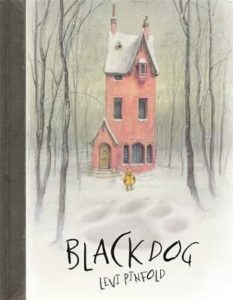 Small’s family is terrified of the black dog. But Small is a brave young girl, and she soon finds out that the dog is not as scary as her family think. The bravery to confront a family’s collective fear comes from the youngest member of the family, a girl called Small. The fear of the black dog, a source of darkness in the outside world, taunts them in their home, but Small goes out with the black dog into the world and discovers that away from the confines of the small world of the home, the dog as a source of fear is not so exaggerated. Small is commended for her bravery by her family.